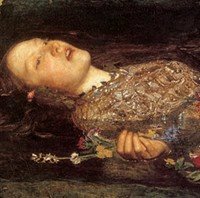 Characteristics of Painting Style of the Pre-Raphaelites. Lady Lever Art Gallery, UK. An important and influential style of Victorian art, Pre-Raphaelitism sprang from a new temper in English painting, reflecting the great moral and material changes of the age which mark the middle years of the 19th century. Hitherto most of the more considerable artists of the century had grown up in the 18th-century atmosphere of academic painting and composition, and their work was the outcome of the impulse which William Hogarth (1697-1764), Joshua Reynolds (1723-92) Thomas Gainsborough (1727-88), and the topographical draughtsmen had given to English painting. Even Turner (1775-1851) and Constable (1776-1837), their great innovations in outlook and technique notwithstanding, were more akin to the spirit of Wilson and Gainsborough than to their Victorian successors. But by the middle of the century a new generation of artists was growing up - forerunners of Modern Art - and not less important, a new public whose taste and outlook were formed by new influences. A reaction against the prevailing mood of the 18th century had already produced the Romantic movement in literature, a religious revival, to which the Evangelical and High Church movements bear witness, and a revived interest in the arts of the Middle Ages, while the industrial revolution had produced far-reaching social repercussions. (Another influence on the Pre-Raphaelites was the work of the Nazarenes, led by Friedrich Overbeck.) All these factors went to form the character of Mid- and Later Victorian painting, and to them must be added the invention of photography and the personal influence of John Ruskin, the first volume of whose "Modern Painters" was published in 1843, and these two last were increasingly powerful influences as the century advanced. visual arts, see: Definition of Art. The effect of these stimuli on different minds naturally varied greatly, but it may be said that their main result was to produce a general temper of moral earnestness degenerating in the case of lesser men into a maudlin sentimentality, a fondness for romantic subjects and a somewhat literal realism of treatment. The method of approach, which was thus engendered in the Victorian painter, was this. He selected from his reading or his imagination a subject which was elevating, pathetic, or romantic, and proceeded to realize this upon his canvas with as near an approach to photographic exactitude as his abilities allowed. The subject-matter of his picture thus assumed a primary importance, and the picture as such had a merely secondary significance. It became a thing not to be looked at, but through, a window behind which was presented a tableau vivant with a moral. It must not be imagined, however, that all typically Victorian painting was aesthetically negligible, or that such an approach is necessarily inconsistent with good art, as is too often suggested today, when perhaps the opposite vice of excessive abstraction prevails. The Victorian painter was, no doubt, always in danger of abrogating his position as a creator in terms of form and colour, but he survived this if he was possessed of natural creative power and a painter's instinct. The new temper was seen at its best and most sensitive form in the work of the Pre-Raphaelite Brotherhood, a group of idealistic young artists who, in the year 1847, banded themselves together to resist what they considered to be degenerate tendencies in the art of their time. The brotherhood consisted of William Holman Hunt, John Everett Millais, Dante Gabriel Rossetti, F. G. Stephens, W. M. Rossetti, Thomas Woolner, and J. Collinson. Of these, the three leaders, Hunt, Millais, and Rossetti, are alone of much importance artistically. See also: Romantic Artists. William Holman Hunt (1827-1910) it would seem, in spite of conflicting evidence, was the real founder of the movement. Brought up in the surroundings of a typical middle-class Victorian home, he had imbibed the strong moral and religious principles of the day, and was by nature a man of independent character and indomitable will. His father, a business man, wished him to adopt a business career, and it was only after overcoming innumerable difficulties that he was able to adopt the profession of art. In 1846, after two failures to obtain admission, he became a student of the Royal Academy Schools, where he made the acquaintance of Millais, already a brilliant student, and later of Rossetti. At this date Hunt had already acquired an independence of outlook, rare in a student, which had been fostered by his early difficulties and struggles, and he had begun to question the blind reverence for "Old Masters" which was instilled into students at the Academy. He criticized, on the one hand, the exponents of the "grand style" who attempted to turn out copies of Raphael and Michelangelo by recipe on the principles of the eclectics of Bologna as transmitted by Reynolds, and, on the other, the feeble triviality of the more popular school of painters. He noticed, as Constable had done before him, the contrast between the fresh green of nature and the prevailing brown tone of the admired old masters. On the technical side he recognized the absurdity of the system which encouraged boldness of handling in young students. The remedies which he proposed amounted to this: choice of worthy and ennobling subjects, strict reliance on nature in their treatment, and a precise and detailed delicacy of handling. These, in fact, were the sum total of the much-talked-of Pre-Raphaelite principles, and they were arrived at not by a study of the Italian primitives but simply by the exercise of common sense and independent judgment. Millais soon became a convert to Hunt's views; and it has been related that when looking through a portfolio of Lasinio's engravings of the frescoes in the Campo Santo at Pisa they recognized in the works of these early artists a spirit of naive sincerity and a reliance on nature instead of rule such as they were aiming at themselves. It was this which led them to accept the name Pre-Raphaelite, contemptuously applied to them by fellow students, which had already been adopted by a group of German painters in Rome, who emulated the manner of the early painters. It was Rossetti, the third leader of the movement, who suggested the formation of a brotherhood and an organized movement to spread their views. The first Pre-Raphaelite pictures, "Lorenzo and Isabella" by Millais, "Rienzi" by Hunt, and "The Girlhood of the Virgin" by Rossetti, were exhibited in 1848, Millais's and Hunt's at the Academy, Rossetti's at the Free Exhibition at Hyde Park Corner. They were all signed with the initials P.R.B. after the artist's name, and, without attracting a great deal of attention, they had quite a good Press. In the following year the meaning of these initials, P.R.B., had leaked out to the Press, and the young artists' pictures were met by a storm of vitriolic abuse quite incomprehensible to-day. John Ruskin, who appears not to have noticed their pictures in 1848, now came to their defence and replied to the futile criticism of their work in two long letters to The Times, in which he elaborated their rather vague ideas of sincerity and reliance on nature into a system of principles for which they had no responsibility. When they first appeared the Pre-Raphaelite pictures must have stood out on the walls of the Academy by reason of the intensity of their bright, clean colour and the highly detailed complexity of their delicate drawing. They had no forcefulness of brushwork or light and shade, and the pigments were applied with a miniature-like precision. A certain awkwardness marked the action of their figures, resulting from the painters' determination to avoid conventional graces of pose and to rely entirely on freshly observed natural gesture. In so far as the pictures showed any likeness to the work of early painters it was to the Flemish rather than the Italian primitives, though there was no deliberate imitation. Indeed the painters probably had little or no knowledge of early Flemish art when their first pictures were painted. In 1851 Rossetti and Hunt went for a tour through France and Flanders, and were impressed by the work of Memlinc and Jan Van Eyck, but the essential characteristics of their work are already present in 1848. In one very important respect their brightly detailed work differed from that of the early Flemish masters, though it is not easy to convey this distinction in words. They succeeded, at least in their most successful work, in investing minor details with a curious intensity and imaginative significance which has nothing to do with any literary or symbolic meaning which they may convey. Every part of the picture, however unimportant, is seen and rendered emotionally, not merely copied with industrious patience. This is the essential Pre-Raphaelite quality which gives their work its curious distinction and raises it above the level of a simple photographic reproduction of a real or imagined scene. Although Hunt was the originator of the Pre-Raphaelite ideals, it seems more likely that Rossetti was mainly responsible for this special quality. Less proficient technically than Hunt or Millais, his mind was already mature at the date of the formation of the brotherhood, and several of his best-known poems had already been written. The burning intensity of his imagination was infectious, and during the years of their association Hunt and Millais caught something of Rossetti's romantic glamour, which is not to be found in their later work after the close connection between them had been severed. During the few years of the brotherhood's existence Hunt produced most of his finest work, including "The Two Gentlemen of Verona" (Birmingham Art Gallery), "The Christian Missionary sheltering from the Druids" (Oxford, Ashmolean Gallery), "The Hireling Shepherd" (Manchester Art Gallery). "The Hireling Shepherd" is perhaps his masterpiece, but all his work has the same earnestness of moral purpose and the same conscientious thoroughness of technique. Unlike most of his associates he adhered rigidly to the Pre-Raphaelite method throughout his long life, but with a steady loss of imaginative intensity. In 1855, his desire to paint Biblical scenes in their actual surroundings led him to visit Palestine and Egypt, a visit which he repeated some years later. These religious pictures are remarkable for their vivid colour, and the indomitable patience with which local detail has been collected and recorded, but his imagination was not equal to his wealth of material, and they do not rise to the level of great religious art. Such works as "Christ in the Temple" and "The Scapegoat" are curiosities rather than works of art, and "The Triumph of the Innocents", in which a more imaginative interpretation is attempted, fails through its prosaically literal treatment of imaginative material. The most important picture of his later life, "The Lady of Shalott", was a repetition in oil on a larger scale of a small woodcut design of 1856 for Moxon's edition of Tennyson. The attempt to recapture the spirit of this charming early work was only partially successful, and it is by the pictures of his early life that his reputation will survive. Note: Many Pre-Raphaelite paintings are also available to buy in most catalogues of poster art. John Everett Millais (1829-96), without either Hunt's intense seriousness of purpose, or Rossetti's fervid imagination, was a more brilliant executant than either, and in a few pictures painted in the early fifties gave the most completely satisfying expression to Pre-Raphaelite ideals. The "Lorenzo and Isabella" of 1848 (painted when he was only 18), was an astonishing piece of work, full of character in the heads and most delicately painted, but it has faults of timidness and awkwardness which disappeared in his later Pre-Raphaelite oils. His technical abilities as an artist enabled him to produce an enormous quantity of work in spite of the elaboration of the Pre-Raphaelite method, and his ease of hand was such that there is seldom any evidence of labour to mar the effect of his pictures. "Ferdinand and Ariel", "Mariana in the Moated Grange", "The Return of the Dove to the Ark", "The Escape of a Heretic", "The Carpenter's Shop", and "The Blind Girl", are a few of the pictures of his Pre- Raphaelite period which show his extraordinary technical gifts. "The Carpenter's Shop" was perhaps the finest religious picture in a period when such subjects were much painted, but seldom with the imaginative insight and creative power to raise them from the level of illustrations to independent works of art. It is painted with a direct naivete and freshness of vision which are unforgettable, and the stillness of the figures combined with the sharp realization of the whole scene produces an effect of truly religious awe. "The Blind Girl" can rank with it. The subject is objectively treated, and its pathos allowed to speak for itself without obtrusion. Neither picture is dramatic, but in each the simplest subject is invested with a strangely moving significance by purely legitimate means. During the early sixties Millais gradually abandoned the Pre-Raphaelite method for a broader treatment which probably owed something to Velasquez, but whose simplicity of vision and justness of values he never achieved. In his later work he was little more than a member of the Victorian popular school of anecdote-painters, though he showed till the end of his life the high manual skill which had distinguished him as a child. "The North-West Passage", "Speak, Speak", "Bubbles" (from which the well-known poster was reproduced), and "Cherry Ripe", are typical of his later work. He also painted portraits and landscapes which were simple transcripts from nature, admirable as such, but without much distinction of imagination or design. The most brilliant student of the Royal Academy as a child, he died as its President in 1896, but the pictures of his early manhood are likely to keep his memory alive when his academic distinctions are forgotten. Gabriel Charles Dante Rossetti (1828-82) was the most imaginative of all Pre-Raphaelites, and his colourful life and work is examined separarely. Please see Dante Gabriel Rossetti. The remaining Pre-Raphaelite brothers produced little work of any artistic interest, but many artists outside the brotherhood adopted their manner, and indeed few of their contemporaries in England were entirely unaffected by their outlook. Their bright colour and high key of tone became general in English painting of the later nineteenth century, and their precise drawing and handling had a most beneficial effect on other artists. The direct influence of the movement divided into two separate streams, the one originating in the work of Hunt and Millais, the other in the work of Rossetti. The first fostered a fresh and unsophisticated naturalism, the second led to the rise of a school of artists whose aims were not naturalistic but decorative. It was natural that the younger painters of the day should most readily succumb to the Pre-Raphaelite charm, but some of the elder painters were also affected, among them Ford Madox Brown, William Dyce and JF Lewis. Of these Ford Madox Brown (1821-93) was most closely associated with the brotherhood. Trained on the Continent, his earliest work is quite unlike that of the Pre-Raphaelites, and reflects various continental fashions of the time. In 1845, he had made the acquaintance of the German Pre-Raphaelites Cornelius and Overbeck, and their work had considerable influence on him for some time. At this date he was, like the Pre-Raphaelites, searching for a new path, and moving gradually in the same direction as they were, as is evidenced by a portrait which he called "A Modern Holbein". Through Rossetti, who came to him for a short time as a pupil, he may have had some influence on the English Pre-Raphaelites, but he was not, as has sometimes been said, the real founder of the movement; and it was not till 1852 that he adopted their methods completely in "The Last of England" (Birmingham Art Gallery). This picture and "Work", now in the Manchester Art Gallery, are completely naturalistic in intention and have all the Pre-Raphaelite characteristics. Both are wonders of patient execution and are crammed with literary meaning, but they are overcrowded by the amount of incident introduced to make this meaning clear. Far finer is the "Christ washing Peter's Feet" (National Gallery). Closely knit and rhythmical in composition, it has a glowing richness of colours which rivals Rossetti's, while the whole subject is conceived with a genuinely poetic insight. It is in every sense a masterpiece. In several other works he attempted the completely truthful recreation of an actual scene, but much of his later work reflects the romantic fantasy of Rossetti. Towards the end of his life his naturally fine sense of form declined, his draughtsmanship became slack, and the crispness of his touch was lost. A commission to decorate Manchester Town Hall with wall-paintings came too late for him to do full justice to it, and the series of paintings which he produced, though interesting in conception, have not the fine artistic qualities of such early work as his cartoon for wall-decoration, "The Finding of the Body of Harold". At his best he was one of the most distinguished of Victorian painters, and certainly deserved more recognition than he obtained during his lifetime. William Dyce (1806-64), a much older man than the young Pre-Raphaelites, yet showed in his later work a close affinity with theirs. Like Ford Madox Brown, he was first influenced by the German Pre-Raphaelites, who, if not very great artists, at least appreciated the merits of fifteenth-century Italian Renaissance art at a time when the masters of the sixteenth and seventeenth centuries alone were generally admired. Dyce based his work on these masters, his drawing was precise and delicate, his colour clear, cool, and smoothly laid on, but it was not till later life that his work showed the close and minutely studied detail of the English Pre-Raphaelites. This phase of his work is well represented by the delightful and rather quaint "Pegwell Bay" (National Gallery), painted in 1858, a most searchingly studied landscape with figures. JF Lewis (1805-76) can only be classed with the Pre-Raphaelites on account of the brilliant colour and high finish of his oil painting, for its emotional atmosphere is quite different. He developed his style quite independently and aimed at an even higher finish than the Pre-Raphaelites. His pictures, mostly of life in Spain and Egypt, have no special distinction in design or draughtsmanship, but as records of an almost photographic exactitude they have considerable interest, and their vivid sun-lit colour gives them some aesthetic appeal. "The Siesta" (National Gallery) and "Lilium Auratum", both gorgeous in colour, represent him at his best as an oil-painter. He also painted much in water-colour in a finely executed body-colour technique suggestive of the handling of medieval miniaturists, but quite unlike them in spirit, which is that of illustrations to a book of travels. As such they are admirable. Of the younger painters who adopted Pre-Raphaelite methods it is only possible to mention a few. They were many. Walter Howell Deverell (1827-54), a friend of Rossetti, painted several pictures of some distinction before his early death from consumption. They are personal, both in conception and technique. His handling was rather less detailed and his paint more solidly applied than those of the other Pre-Raphaelite painters, but he died too soon for his personality to develop completely. One of the most successful painters associated with the Pre-Raphaelite idiom, was Lord Frederic Leighton (1830-1896), although his subjects were far more classical than traditional. He also personnified the 'art for art's sake' creed of the 19th century English Aestheticism movement. Another, more romantic, painter of historical and literary works in the general Pre-Raphaelite manner was John William Waterhouse (1849-1917), whose Lady of Shalott (1888, Tate Collection) is one of the most popular paintings by any 19th century English artist. Charles Allston Collins (1828-73), Arthur Hughes (1832-1915), W. L. Windus (1823-1907), the Irish painter William Burton (1816-1900), and Frederick Sandys (1832-1904) all produced interesting work in the Pre-Raphaelite manner. "April Love", by Arthur Hughes, is one of the most wholly successful pictures of the school, delightful in colour and most delicate in execution. In its painting of details of foliage it is equal to Millais, and it surpasses the general level of his work in imagination. Hughes produced other work of delicacy and charm, but most of it is not quite on this level. Frederick Sandys was a particularly forceful and vigorous draughtsman and designer who was at his best in book illustration. His oil-paintings of romantic subjects were too often hard and metallic in execution and unpleasant in colour. In spite of obvious and almost insuperable difficulties several painters applied the Pre-Raphaelite methods to pure landscape. J. W. Inchbold (1830-88) and George Boyce (1826-96), a water-colour painter of no little charm, both did so, as well as John Brett (1830-1902), the marine painter. Brett was an early convert to Pre-Raphaelitism, and in the elaborate background of "The Stone-breaker" painted what was virtually a pure landscape. He followed this by the "Val d'Aosta", a miracle of patience, and his later panoramic sea-pieces certainly owe something to the Pre-Raphaelites in their high finish and bright colour. Other followers of Pre-Raphaelite naturalism in some of their pictures were Sir Noel Paton (1821-1901), Sir William Fettes Douglas (1822-91), James Archer (1823-1904), W. Bell Scott (1811-90), Thomas Seddon (1821-56), R. B. Martineau (1826-69), G. D. Leslie (1835-1921), G. A. Storey (1834-1919), and Byam Shaw (1872-1919). Sir Edward Burne-Jones (1833-98) was by far the most important of the painters whose work derived from Rossetti rather than from Pre-Raphaelitism in the strict sense. With him was closely associated the designer William Morris, who, though he painted few pictures, had a great influence on English art through his decorative work, his writings, and his lectures. Edward Burne-Jones (1833-98), the son of a small frame-maker in Birmingham, was originally destined for the Church, and did not take to painting until he was twenty-three. While still under-graduates at Oxford he and William Morris were fired with an enthusiasm for art by the sight of some Pre-Raphaelite pictures. Both abandoned their original career, and Burne-Jones took to painting under the guidance of Rossetti. He had had no previous training, but on Rossetti's advice took to producing original work at once. In the circumstances this was probably the wisest course, but certain weaknesses in his work, particularly a poor understanding of solid form, are due to his lack of thorough training, and they persisted to the end of his life. In his earliest work Burne-Jones identified himself as completely as possible with Rossetti both in subject and treatment. But even in such early water-colours as "Clara Van Bork" and "Sidonia Van Bork" a distinct personality can be discerned under the Rossettian disguise. This period did not last long, and as his own personality developed, Rossetti's influence was superseded by that of certain Italian painters, notably Botticelli, Michelangelo and Mantegna. His really outstanding gift was for abstract linear pattern, a gift which will enable his work to survive beyond that of several others. In this connection the fact that Burne-Jones was of Celtic stock is suggestive, for it was from Celtic art that the English medieval tradition of linear pattern originally devolved. By nature Burne-Jones was fitted to carry out decorative work on a large scale, but in England he did not have the opportunities which would have been offered to him if he had been a Frenchman. A few schemes of mural decoration for private houses and a series of mosaics for the American Protestant Church in Rome represent the bulk of his decorative work except in stained glass. His name is now mainly associated with windows executed by the firm of Morris and Co., which had been formed by his friend William Morris to carry out decorative work of all kinds, in accordance with the principles of the Arts and Crafts Movement (c.1862-1914). Some of his cartoons for these are among his best work, for example the "Crucifixion", designed for St. Philip's Church, Birmingham, and now in the Victoria and Albert Museum, but they are almost invariably disappointing in glass. Morris' failure in glass is surprising in view of his genius for most of the artistic crafts which he practised, and of his passionate admiration for the glass of the Middle Ages. A number of other artists have been inspired by the work of Rossetti and Burne-Jones, among them Walter Crane (1845-1915), Simeon Solomon (1840-1905), and Spencer Stanhope (1829-1908). None of these was a Pre-Raphaelite in the original sense of the word as used by Hunt and Millais. Their aims were primarily decorative and not naturalistic, and the work of Rossetti is the only link between them and the original movement. In another sense they may justly be called Pre-Raphaelites, for most of them show the inspiration of artists who lived before Raphael. Pre-Raphaelitism was the most important artistic movement of the Victorian age in England. As a movement it has been for some years out of fashion, but its influence on English art is not yet exhausted. From it originated the renewed interest in decorative crafts which helped to launch such societies as the Arts and Crafts Society and the Art Workers' Guild, and raised the standard of decorative art throughout England. It checked the rapid decline in English painting apparent in the early years of the nineteenth century, and Pre-Raphaelite inspiration can still be seen in the work of many English painters of the modern school, side by side with elements derived from foreign sources. (For the influence of Romantic art on painting in Germany, see: German Art, 19th Century.) Burne-Jones, in particular, for all the languid grace of his figures, now so unfashionable, was, in his insistence on the abstract elements of picture-making, a forerunner of modern art.  For more about 19th century English painting, see: Homepage.  For the history of culture, see: History of Art Timeline.